Take your favorite programming with you - from the home or office to the patio, park or anywhere in between. Dynamic sound: Full audio range from a 2.1 system with separate tweeters, midrange speakers and powerful subwoofer. Powerful bass: Dedicated subwoofer plus bass enhancement technology provides hard-hitting bass response. Easy and convenient portability: Take Satellite Radio wherever you go with a concealed, fold-up handle, built-in Indoor/Outdoor Home Antenna cradle and cable storage, and optional battery power (8 D-cell Batteries sold separately). Built-in Headphone and Aux In Jacks: Listen privately using the Headphone jack. 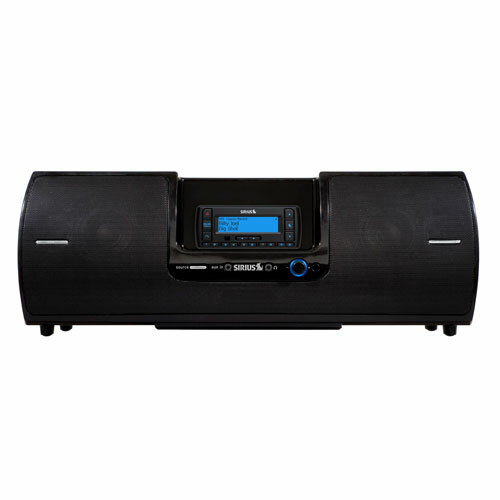 Play MP3 players, CDs or other audio devices via the Aux In jack (Aux In Cable sold separately).